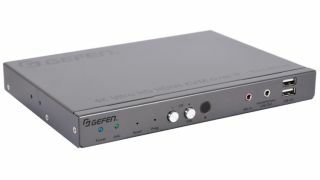 The What: Nortek Security & Control company Gefen has begun shipping four new models in its Gen 2.0 AV-Over-IP product line, the EXT-UHD-LANS-TX, EXT-UHD-LANS-RX, EXT-UHDKA-LANS-TX, and EXT-UHDKA-LANS-RX. The introduction aims to provide systems integrators with scalable, high-performance routing and distribution solutions that set new standards for performance and reliability. The What Else: The EXT-UHDKA-LANS-TX (sender) and EXT-UHDKA-LANS-RX (receiver) solutions are designed to enhance AV extension and management for workstation environments where video and USB connectivity is required. In addition to basic KVM functionality, the new KM Emulation feature facilitates real-time simultaneous keyboard and mouse control of each source from all connected workstations, eliminating the inherent limitations of earlier systems. Power over Ethernet allows the sender and receiver units to be powered through a standard PoE-enabled IP network switch, without the need for external power supplies. Used in conjunction with the EXT-CU-LAN Matrix Controller, system configuration is automated and quick. Its Mass-Firmware-Update (MFU) feature keeps the entire system up to date without the need to access and upgrade each unit separately. The receivers features a built-in scaler to help optimize the image for a variety of displays and different viewing environments. A video wall controller accommodates any screen configuration up to 16x16 and provides flexibility in sizing and manipulating live and signage content in demanding installations. The EXT-UHDKA-LANS-RX’s integrated USB hub with two USB 2.0 and two USB 1.1 ports accommodates touchpanels, keyboard and mouse, and a variety of supported devices. This feature, along with analog audio inputs and outputs, make these products particularly suited for use in collaborative and interactive installations. A built-in, two-port Gigabit switch on each receiver allows the daisy chaining of additional receivers or other IP-enabled devices. In applications such as digital signage, where content is often replicated on multiple displays throughout the installation, the ability to cascade the receivers removes the requirement for each cable to be run directly to the main network switch. This extends signal range far beyond the limits of a point-to-point video distribution system. These new products are capable of 4K at 60Hz, 4:2:0 maximum input resolution, and maximum output resolution of 4K at 30Hz, 4:4:4. When used with Gefen DVI-to-HDMI cables, they support the use of single-link DVI sources and displays up to 1080p and 1920x1200 (WUXGA). Each cable run from a sender to a receiver or from a sender or receiver to the network switch and can be up to 100 meters (330 feet). The sender and receiver can be used as extenders in a one-to-one system, or as nodes in a virtual matrix environment where any source can be routed to any or all displays, supporting up to 39,900 senders and a combination of more than 65,000 senders and receivers.